The Excitement of the Main Gates at Canada's Wonderland! The Canada's Wonderland of my youth was filled with endless summer days, friendship, fun and excitement! I remember the thrill of getting my first season's pass at Canada's Wonderland, and the feeling of freedom that washed over me. I loved the exuberant music that pumped me up as I entered the main gates, the enticing scent of the concession stand food, and the fireworks that exploded overhead and sent me off at night. 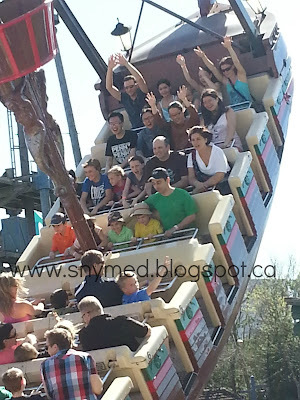 The Opening Day of Canada's Wonderland May 5, 2013! Many years have passed since those golden days of summer, but what remains unchanged is that Canada's Wonderland still offers big fun for kids of all ages--and their families. It was in that spirit that I returned to Canada's Wonderland with my family on Opening Day, May 5, 2013! As our kids are aged 2- to 7-years old, we first had the kids measured and banded for height, so we would know which rides they were allowed to visit. Then we headed to Medieval Faire to go on The Rage! My husband could not resist taking the kids 4-years old and older on this gigantic rocking boat! Check out my video of The Rage, just below this photo! Captain, Abandon Ship! It's The Rage! From Medieval Faire, we went directly to Planet Snoopy. 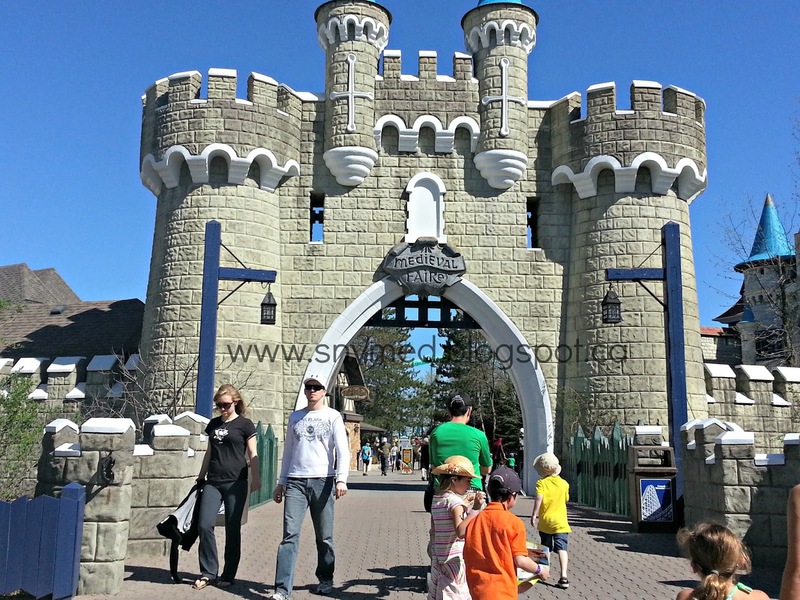 It is one of two ride areas of Canada's Wonderland that are perfectly suited to young children. We Have Landed at Planet Snoopy! Right away the kids had a very pleasant meeting with the Snoopy gang! 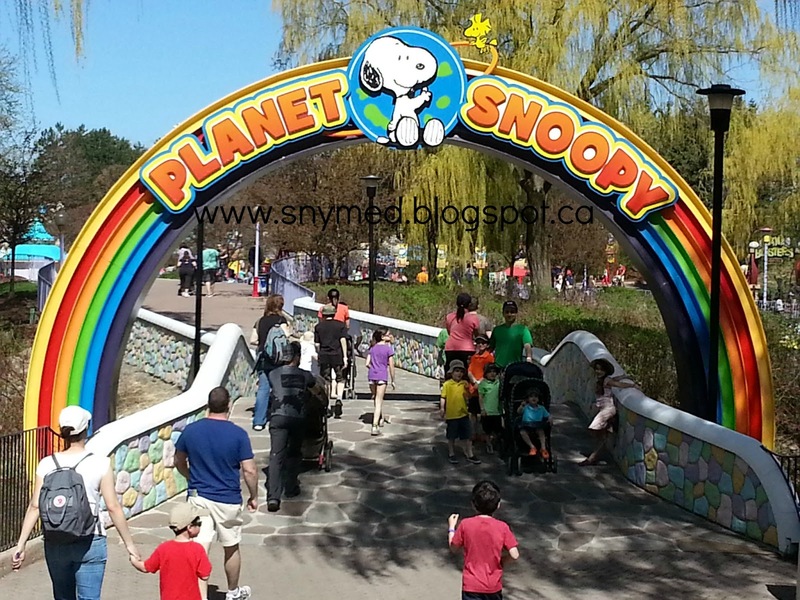 Seeing the characters at Planet Snoopy really added to the excitement of Canada's Wonderland! The Kids Met the Snoopy Gang at Planet Snoopy! Next, we went on one of my favourite rides: the Swan Lake ride! It's a very peaceful ride for parents and children of all ages. Colourful ride-on swans take riders on a tour of the cool and calm lake, which is wonderful on a hot day (like we had on Opening Day). Peaceful Swans on Swan Lake! Swan Lake at Canada's Wonderland (VIDEO)! Note: only one adult is allowed on per swan, although multiple children may ride. However, "parent swap" is available if each parent wants a turn riding with the same child. Simply tell the attendant, and you will not have to line up a second time. Check out my Swan Lake ride video, above! Snoopy Vs. Red Baron Ride at Canada's Wonderland (VIDEO)! Next the kids did a beeline for Snoopy Vs. Red Baron ride! It's an adorable airplane ride that puts the kids in the pilot's seat! I remember going on a similar ride when I was a child, and my mom still has footage of my brother and I on film from the 1970s! Fun then, still fun today! 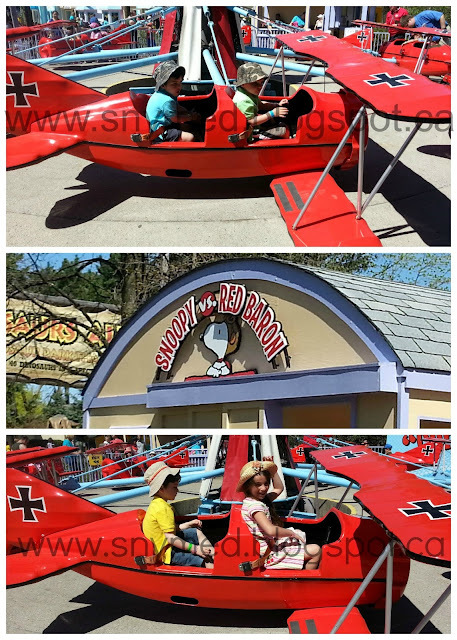 Click the video above to see my footage of the Snoopy Vs. Red Baron ride! It was time to put on some sunblock and think food at this point. Earlier we had picked up a few containers of fresh fruit for the kids to snack on for only $3.99, which I thought was an excellent value for what we got--especially at a theme park. Hours had passed since then, so we headed for an outdoor barbecue lunch at The Courtyard Restaurant located beside Medieval Fare. 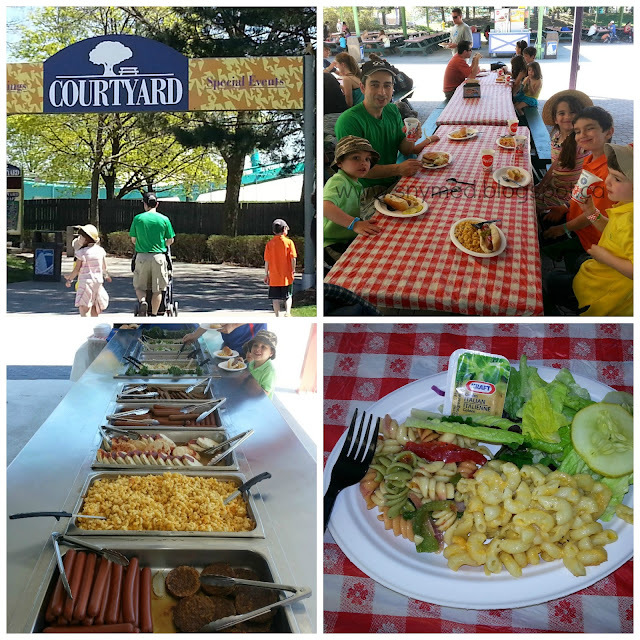 Choices included burgers, hotdogs, chicken burgers, macaroni and cheese, coleslaw, pasta salad and green salad. There was also a refillable soft drink station. The buffet was a good choice for us, as the kids were ravenous and had eaten all the little snacks we had packed with us earlier in the day. Good to note: Canada's Wonderland allows water into the park. 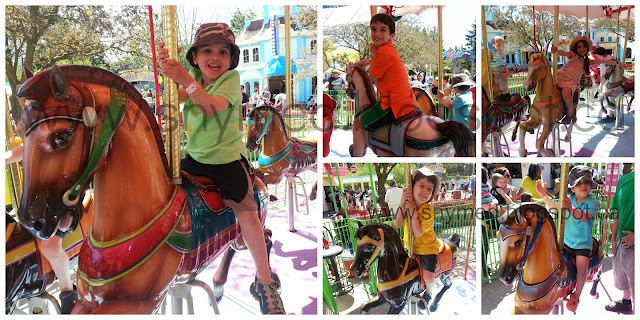 Character Carousel at Canada's Wonderland (VIDEO)! Half of the day had already passed when we headed back to Planet Snoopy. The kids really wanted to ride on the Character Carousel, and each got their very own horse. This was great fun for all kids, aged 2- to 7-years old! See my Character Carousel ride footage in the video, above! Snoopy's Space Ride at Canada's Wonderland (VIDEO)! The kids also wanted to go on Snoopy's Space Ride, so we went there too. The ride can seat 4, so siblings will be able to ride together in the same car. Take a look at my video of Snoopy's Space Ride, above! Taking a Ride at Kidzville Station! We eventually made it to Kidzville, the second ride area of Canada's Wonderland that is devoted to young children. First stop was the train ride called Kidzville Station: All Aboard! The ride was lots of fun, as it gently chuffed around the peaceful track. See my Kidzville Station train ride footage video, below! 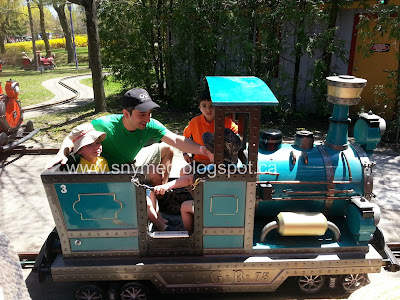 Kidzville Station Train Ride at Canada's Wonderland (VIDEO)! Swingtime was a lot of fun for my kids! I love it because it's a miniature version of their adult ride "Swing of the Century". In my youth, this same adult ride was called "Swings of Siam". Swingtime is a sweet little ride that delivers exactly what it offers: an exhilarating swing experience, but not overwhelming for little ones. Swingtime Ride at Canada's Wonderland (VIDEO)! My husband decided to take the older kids on some more adult rides, so I took my youngest two guys to Jokey's Jalopies, the antique car ride! It was also a hit with my guys! I love that it's on a huge, wide-open track and it is a nice welcome to the busy park. My kids loved guessing which colour car was going to take them for their ride, and "driving" the car. I enjoyed that the ride was cool and allowed us a short respite from walking. Jokey Jalopies Ride at Canada's Wonderland (VIDEO)! Can you guess which ride the boys wanted to visit next? If you guessed Chopper Chase, then you got it right! Chopper Chase is a gentle ride that takes you up on an aerial track in a brightly-coloured helicopter. This is a weather-proof ride that allows you to explore Kidzville below you, at the same time keeping cool from the sun, and dry from the rain. There is even a set of bicycle pedals in the helicopter to keep your little one occupied. Chopper Chase Ride at Canada's Wonderland (VIDEO)! Would you believe that after 7 hours of Canada's Wonderland, we had barely scratched the tip of the iceberg? There were still many rides that we did not visit in Kidzville or Planet Snoopy, and we had not even explored the rest of the park! The kids were hot, so we purchased Canada's Wonderland famous funnel cake for the family to share. 6 of my family members ate it, and 2 portions were still left! It definitely is a great value if you are sharing it among several people. 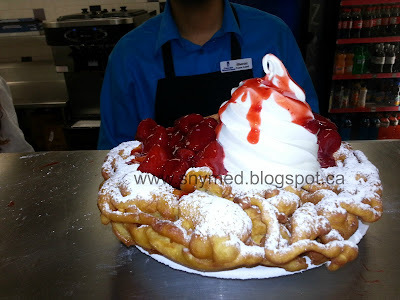 The Funnel Cake at Canada's Wonderland! 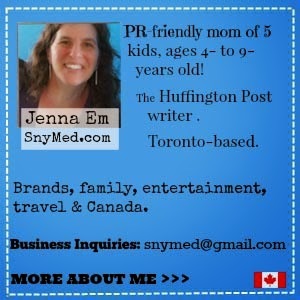 Sharing a Funnel Cake at Canada's Wonderland (VIDEO)! 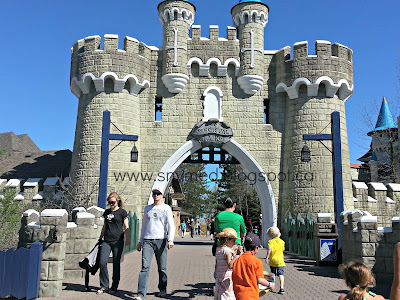 It would not have been a proper day at Canada's Wonderland without playing some of the games! My husband tested his skill, and the kids ended up with this cute stuffed animal! Needless to say, there were smiles all around! Trying Our Luck at Canada's Wonderland! 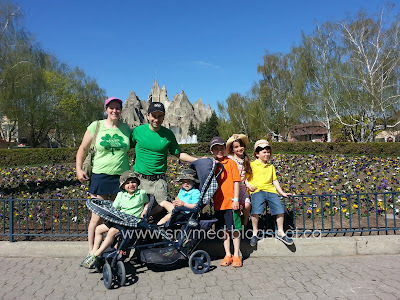 I was really glad that I brought the double stroller to Canada's Wonderland with shade canopies, as the youngest kids were really tired and the extra shade helped them (although they were wearing hats, and we brought sunscreen with us). We decided that we would make one more stop and visit Dinosaurs Alive. Admission cost an extra $5 per person in addition to regular park admission. 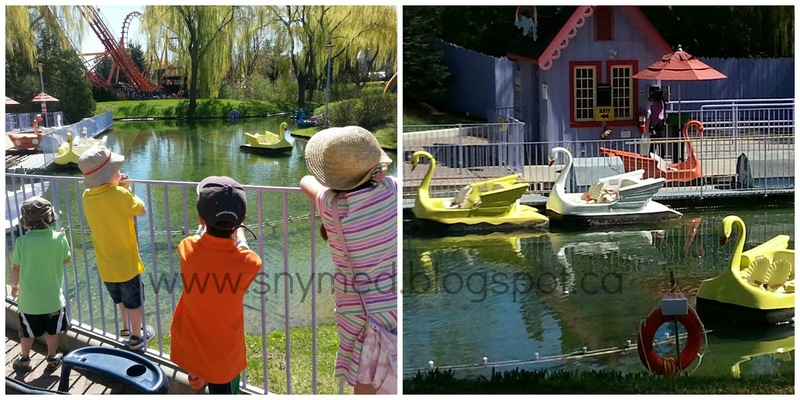 A Peek at Dinosaurs Alive Exhibit at Canada's Wonderland (VIDEO)! I didn't know what to expect, but Dinosaurs Alive really held the attention of all 5 of my kids. My 5-year old was frightened of the roars of the animatronic dinosaurs, but my 2- and 4-year olds were fine with the sounds. It really was a great exhibit, and the dinosaurs were built to scale. As you walk through Dinosaurs Alive, there are signs that describe the type of dinosaur that you are seeing. More Footage of the Dinosaurs Alive Animatronics Exhibit at Canada's Wonderland (VIDEO)! The best surprise at the end of the exhibit, was a dinosaur dig situated beneath 2 oversized sun umbrellas. Staff are on hand to help youngsters to unearth the fossil of a T-Rex, and provide encouragement and narrative as the kids dig with special tools. I was glad that we saved Dinosaurs Alive for last, as the kids enjoyed relaxing in the shade and digging for fossils in the sand. We had to drag them away eventually, as they did not want to leave. I would definitely recommend this exhibit to families visiting Canada's Wonderland. I believe that kids 2 years and under might be free at Dinosaurs Alive. After about 8 hours at Canada's Wonderland, this family was exhausted and ready to head home! As we drove home, I reflected on the quality family time that we had had together. My kids had really loved their day out, and asked us to take them back next month. There's definitely value in purchasing a Canada's Wonderland season's pass, if you are planning on visiting twice or more this season. If purchased before May 20th 2013, the season's pass is available for as low as 6 easy payments of $11 ($66). The park was too big for my family to see the whole park on just one visit, so a season's pass is a great idea for those wishing to return at a later time! Of interest, the Canada's Wonderland season's pass offers exclusive early ride times, early entrance to the Splash Works water park, food and merchandise discounts, and exclusive tickets discounts. In contrast, Canada's Wonderland single tickets cost $46.99 (adults) and $34.99 (juniors/seniors). Canada's Wonderland added Dinosaurs Alive in 2012, and will be focusing on dazzling visitors with their entertainment programming for the 2013 season. There is supposed to be a great Charlie Brown live so, which we'll have to see when we return to Canada's Wonderland in June! 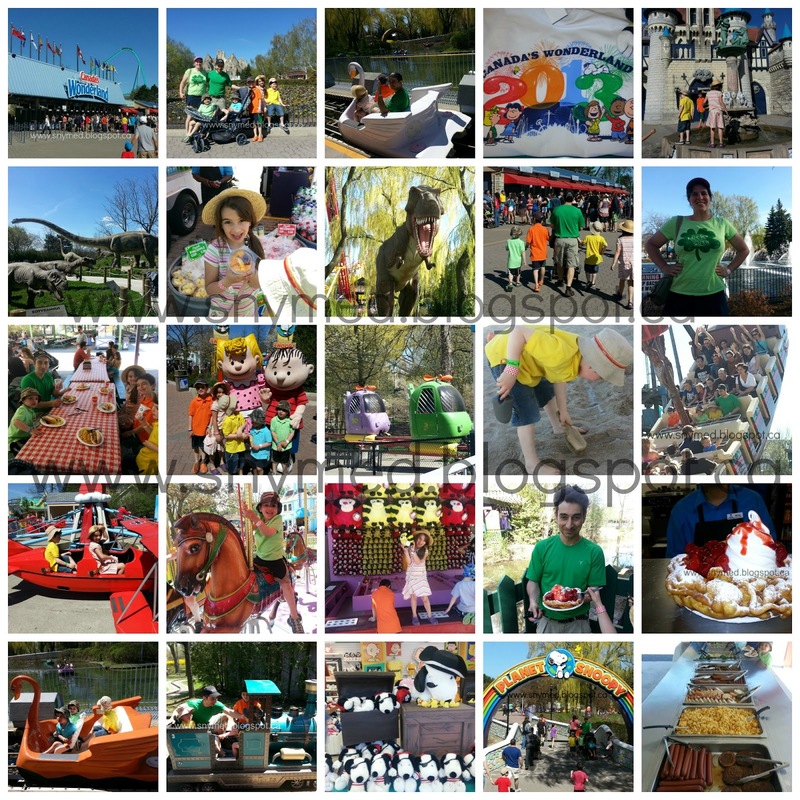 Just so much to do at Canada's Wonderland! If you are considering purchasing a season's pass this year, consider the Canada's Wonderland season's pass for 2013! The park is open every weekend in May, and every day starting June! Canada's Wonderland Opening Day May 5th, 2013! 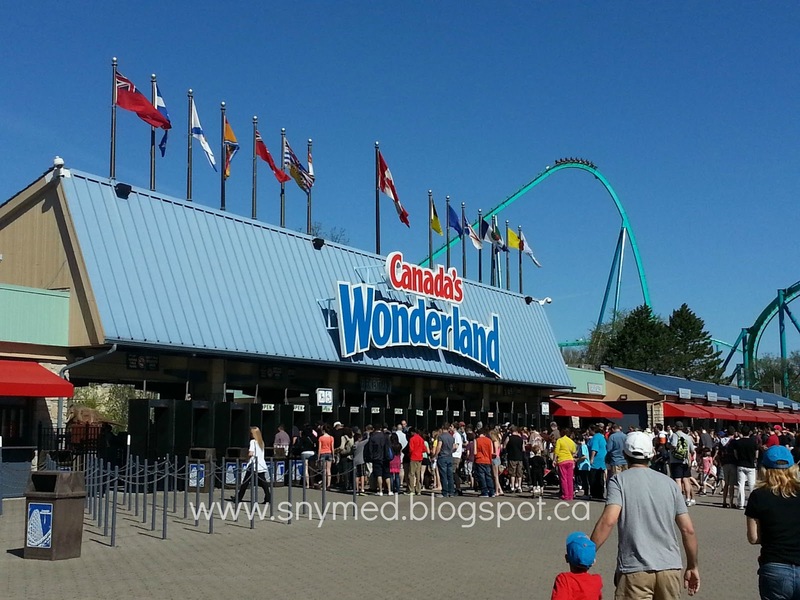 Have you ever taken your family to Canada's Wonderland? What are your favourite kinds of rides? I haven't been there in ages. Lots have change since. Love all the photos you posted and the videos. The season pas is ridiculously low- that is great. I wish we had a park like this in Ottawa. Thanks Lyne! There was really a lot to do, and it would take a week to do it all. Mom vs. the boys, your boys would love Planet Snoopy and Kidzville. They are definitely the right age for it. I love that you can have your kids measured and banded so knowing which rides are ok is easy! Our youngest would love Planet Snoopy, although to her, he's "F-noopy"
Ashley, too cute about the way your daughter pronounces Snoopy! I did like their measurement and banding system, so we knew in advance which rides were open to the kids. I love all the gorgeous pics! I lived in Toronto for five years but was pregnant/nursing for most of them so I still haven't been! Awesome review. Great photos and videos!! We'll have to take our girls! Looks like they'd love it! Thanks Wendy! Your girls would have a great time at Wonderland! I would like to see that one day - thanks and Happy Canada Day! wow! I haven't been in probably 6 years! We keep talking about taking the kids...I think this will be the year! I would love to take my kids some day but they both will have to be old enough to remember. Wished this great place was closer! The last time I was there the boys were only old enough for the toddler rides. It was great reading about the new attractions and looking at the great pictures of your family having fun. Nice! Sounds like a lot of fun I really hope I can take my family to wonderland this year! Thank you for the review! This looks like so much fun, I cant wait to go! looks like you had lots of fun ! looks like lots of fun time there! i cannot wait to go there! We went this summer and had a great time, I even went on the Leviathan and almost wet myself! I went once many years ago with a friend. We went on Roller Coasters! I didn't know about all of the different rides as we only sought out the roller coasters. I would love to go back with my family and see all that's changed over the years! Thank you! Loved the pics! Thank you for sharing. It brings back memories from when our children were little and we took them there. We had a great time too. I have been when our kids were little, now I would love to take our grandchildren there! 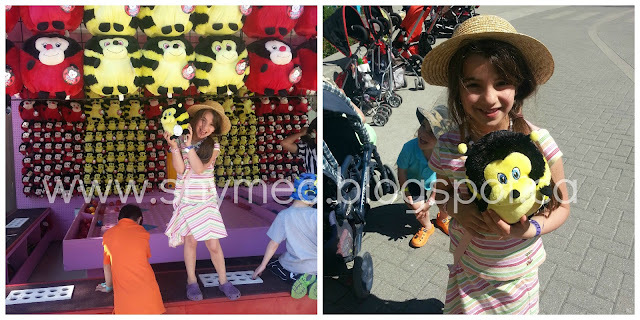 To be honest, although they loved the rides, they loved the shows even more!!! They have amazing entertainment!! Great looking place to visit for sure! This place in on my bucket list,we never made it in 2016 fingers crossed for this year. 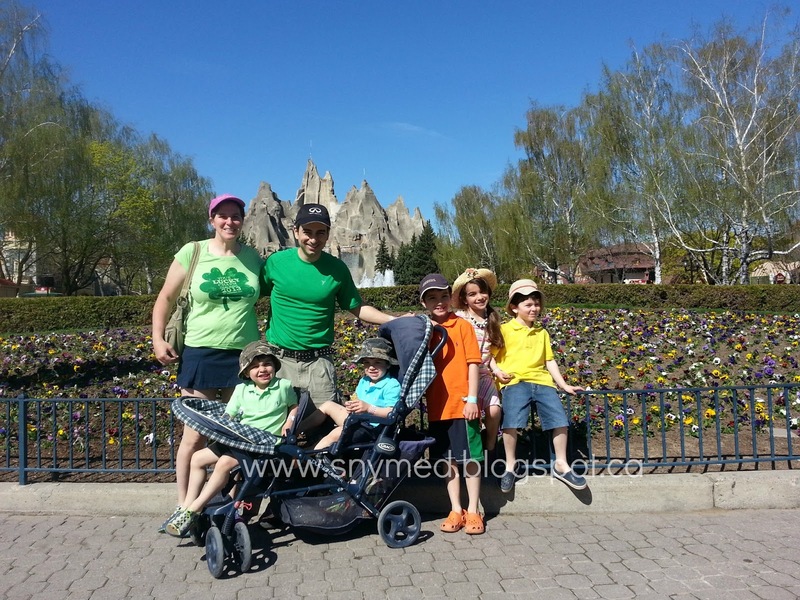 We love Canadas wonderland, especially the white water canyon. We have been to Canada's Wonderland several times and love it very much.The time just flies by when having so much fun.I can't wait to take my grandchildren now.